A couple of good friends visited me from the USA this summer. Of course they wanted to visit London and were especially keen to see The Tower of London. Since you get more out of a visit when you know a bit of background reading, I started looking around the internet for some engaging potted histories – when it occurred to me that I had shelves of them behind me. 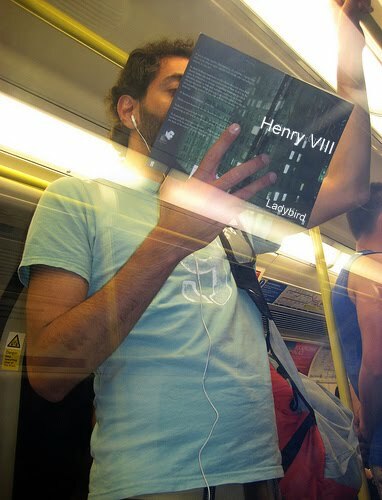 I took down a couple of History series books – Henry VIII and Elizabeth I and rather tentatively, suggested they might want to look them. Once my friends had got over their surprise that Ladybird Books weren’t just about fluffy bunnies and obedient school children – an impression they’d picked up from the books they’d noticed lying around my house – they picked up a book and started reading. And reading. They read right through a book each in one sitting and then swapped books , occasionally reading out snippets to each other – and asked for more! My friends are both over 50 and educated to Post Grad level – but as an engaging intro to interesting periods in British history, these little children’s books ticked the box as no other. The following day, they headed off to the Tower of London, sitting on train and tube happily reading their Ladybird Books. “Yes”, they said afterwards, “they’d got a few strange looks”. But these two aren’t the sort to care.